Coupon must be used instore, Coupon books available usually by entrance. You don't need the coupon book. They always scan a voucher stuck to the till and that checks if any purchases have any applicable discount to be applied. This oven is great. It comes with the height raiser ring too. I cook a chicken in about 70 mins in this and the skin goes all nice and crispy. Put the chicken in breasts down for first 20-30 mins then turn over for remainder of the time. This ensures it is fully cooked and stops the top getting burnt. Great for oven chips, potato wedges, cooking lasagne etc etc. 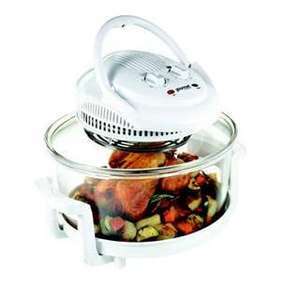 Heats up fast and leaves the main over free for cooking something else. I use mine almost every day, love them. I got mine from Costco around two years ago. I'm considering picking another up as it would just be cheaper than buying replacement parts. Can I get this if not a member? Only if you take a member with you i'm afraid. i love using my halogen oven .